I have patiently, persistently, and politely dealt with errors made by insurance companies and billing from doctors and facilities. I have patiently, persistently, and politely asked the IRS for help in resolving 2 major issues that came from the year my husband died. I have made mistakes that I would have had no way to even ask questions that would have prevented the problems that arose. I have so many balls to juggle that I just can't keep them all going all the time. With the school and activities schedule of 2 high school students plus the 70 hours or more that I often put in at my job plus managing all of the regular financial issues in addition to the IRS, insurance, retirement, and college issues i feel so overwhelmed all of the time. Facing cancer with my husband was hard, but we faced it together every day with love and courage. 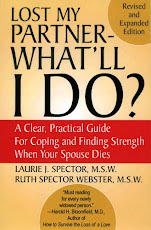 Facing widowhood is something I face alone. Facing the challenges of parenting teenagers is also a heavy burden when you carry it alone. And then the financial fears of providing for daily needs as well as trying to save a little for weddings, college educations, and maybe someday down the road our first vacation without my husband. For widows, the alone factor is also complicated by the "fear factor" of wondering how we will survive for the next 20 to 30 years without our mates. Thank you for so eloquently describing the difficulties and challenges you're struggling with. At this point in time,the future must seem overwhelming. Try to focus on one problem at a time.It also helps to reach out to others(temporarily) for assistance and support.